Philippine Army troopers on offensives against the New People's Army in Casiguran, Sorsogon. Photo by Bicol Today. In the few days since the military sounded the drums of war, bombs have been dropped indiscriminately on Lumad communities in Sarangani, causing thousands of civilians to evacuate. NGO workers in Bacolod and Baguio City have been nabbed and accused of being alleged “high-ranking” NPA leaders. In Davao City, a construction worker accused by the military as an NPA “supply officer” was killed inside his home. It’s the beginning of a predictable storyline and one as old as time: when the people suffer injustices and abuse under the hands of the military, an even greater number of them are pushed to take up arms—thereby perpetuating the very conflict that an “all-out war” seeks to end. The illogic of this war is the reason why nobody, save for rabid anti-communists, is enthusiastically behind the AFP. Unilaterally terminated by President Duterte against the advice of his own peace panel, there is popular support for the peace talks and a clamor for it to continue. The National Democratic Front of the Philippines (NDFP), after all, has rejected the manner with which the talks were ended, and expressed its readiness to proceed with it anytime. Unfortunately, the stage for an “all-out war” is at the same time being aggressively set. Contrary to what it may seem, military propaganda to sell the war started way before the guns started firing. It actively fed wrong assumptions about the peace process. It capitalized on the fact that the countryside and its people (where the frontlines are) are largely invisible to the opinion-setting, urban-based public. Lastly, it rode on all the advantages of a superior army: an established public relations machinery, close ties with and easy access to journalists, and even paid online warriors. Last August, at the beginning of the peace talks, Duterte ordered the AFP to “be friendly with the forces of the revolutionary government of the Communist Party of the Philippines (CPP).” It is, after all, the most simple essence of the GRP’s unilateral ceasefire. Yet, the AFP chose to maintain its counter-insurgency program Oplan Bayanihan (which they renamed Oplan Kapayapaan, now a paradox of their own “all-out war”). They insisted on their presence in, by accounts of the CPP, 500 barrios known to be strongholds of the revolutionary movement. What is the reason? It is certainly not to play jackstones with the NPA. 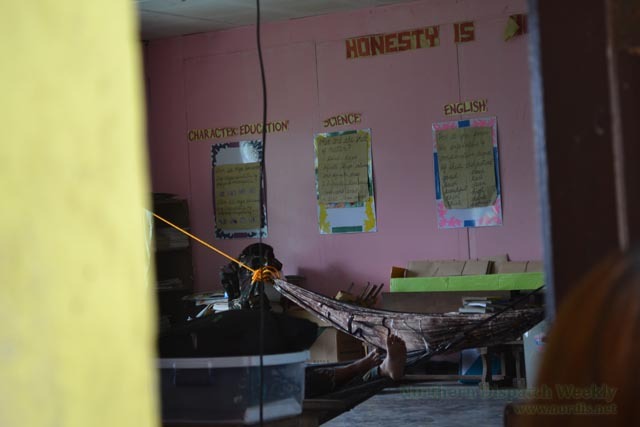 Based on reports from different provinces in the last six months, the AFP has encamped in houses, barangay halls, day care centers, schools, and health centers–in violation of international war protocols–in hundreds of village interiors. During those periods of encampent, residents have complained of being harassed, interrogated on their alleged links with the NPA, being hamletted or prevented from going to their fields, or their houses broken down by soldiers looking for Red fighters. Some civilians have also been beaten up and tortured. Soldiers from the 50th Infantry Battalion occupying Western Uma Elementary School in Lubuagan, Kalinga. Photo by Alma B. Sinumlag/ Northern Dispatch Weekly. These complaints from the margins have largely been underreported. But when asked about these operations, the military claims “maintaining peace and order,” “anti-drugs campaign,” and “development work.” Unfortunately, none of it make any sense. Troops do not need to stay for months in a certain far-flung village if all they were doing were merely responding to threats of “peace and order.” As for the anti-drug campaign, Carilo Mujeres, a farmer from Masbate interviewed by Bicol Today makes a good point: “They tell us that they are looking for drugs. But we don’t even have money to buy pesticides.” Even the “delivery of social services” and “population census” are tasks relegated to civilian authorities, and are certainly questionable if they came with threats and intimidation, as reported by residents. On February 1, CPP announced the lifting of its unilateral ceasefire effective after 10 days, and in the meantime ordered the NPA to immediately go on “active defense.” More precisely, it ordered all NPA units “to counteract, frustrate, and punish” interior patrol operations by state forces conducting counter-insurgency operations. Subsequently, there came reports about various clashes across the country. In the news, however, many of these clashes were simply reported as incidents of “escalating violence” wherein “soldiers were killed” in “attacks launched” by the NPA. Stories often failed to place these clashes within the proper context of the peace talks, and cited exclusively military sources. They thus gave the public an incomplete and unbalanced picture of the conflict—and in a way may have helped the AFP set the stage for war. The CPP had already been forewarning the GRP and the public about the possible lifting of its ceasefire, and actions to defend itself and the people its “revolutionary territories” from combat operations of the AFP. Even if one did not accept the communists’ assertion of territories, the statements made by the AFP as to what their soldiers were doing when they were killed fail the tests of credulity. At the very least, they do not deserve to be echoed unquestioningly or one-sidedly. For instance, the clash in Manay, Davao Oriental last February 1 that killed 2nd Lieutenant Miguel Victor Alejo was reported by Rappler simply as the killing of a kind, “soon-to-be-wed” soldier in an “attack” by the NPA—drawing, of course, sadness and anger from its ubiquitous mood meter. In another report by ABS-CBN.com, the 10th Infantry Division said that the soldiers were in the area pursuing “armed lawless elements” who were allegedly “forcing people to evacuate.” Several questions are begging to be asked: did they not know that these “elements” were in fact the NPA? How probable was it that there was another armed group in an interior known as a communist stronghold? If it were indeed the NPA they were pursuing, weren’t the NPA then carrying out an act of defense? Why would the guerillas—who are known to thrive on the support of the population—even force people to evacuate? Isn’t it more probable that people evacuated because of military operations? The next day, the NPA released a statement on its own version of the incident: “At around 7:00 in the evening on January 31, troops belonging to 67th IB AFP were already deployed for combat operation in the villages of Kayawan, del Pilar and Kapasnan in the hinterlands of Manay town. The next day, February 1, the AFP troops interrogated several masses in the community on the whereabouts of the Red fighters…At midday, while maneuvering to evade the enemy’s four-column combat operation, the NPA unit was fired upon by the scout platoon of the 67IB. Immediately, Red fighters maneuvered to retake the initiative and engage the enemy. Killed in the encounter was 2Lt. Victor Alejo, while another enemy troop was severely wounded. As the Red fighters safely withdrew from the clash site, the 67th IB soldiers waylaid two civilians in their frenzied shoot-out after the firefight.” None of the aforementioned media reports carried the side of the NPA. TV Patrol reported on the evacuations, but did not verify how the two civilian farmers had died. Still many other incidents reported by the media as “attacks” or “ambushes” by the NPA actually begun, by the AFP’s own admission, as operations allegedly responding to “reports of armed men” in the hinterlands. Well of course there are armed men (and women) in the hinterlands! They are their revolutionary counterparts being represented at the negotiating table. Perhaps the military does not really like the idea of having equal counterparts, which is what the peace talks are all about. Finally, there is the killing of three soldiers in Malaybalay, Bukidnon—the incident that is said to have angered President Duterte enough to have terminated the talks. It is a classic case of “he said, she said.” The AFP said that the soldiers were unarmed when “abducted” and peppered with bullets. The NPA, meanwhile, said the soldiers were drawing their pistols at a checkpoint, and were shot in self-defense. The NPA also said that the soldiers have been part of a unit encamped in two villages since last year, harassing civilians—contrary to the military’ statement that they were there only to “secure permits for a livelihood project.” But the NPA’s full clarification of the incident—wherein they even provided the serial numbers of the soldier’s pistols to prove that they were armed—came several days after. By then, they had already been accused by the AFP publicly of many things, even stealing the soldiers’ allowance (which the NPA also vehemently denied). By then, the flames of war had already been fanned. The attainment of just and lasting peace through successful peace negotiations may yet have a chance. Boosting chances for peace, however, requires a much greater understanding of the peace process from the public, and the media that reports it. The most basic premise being missed is that there are two governments talking. Two armies operating. Two sides to one story. And the truth is, one side has always been marginalized—but it has also never been crushed through war.